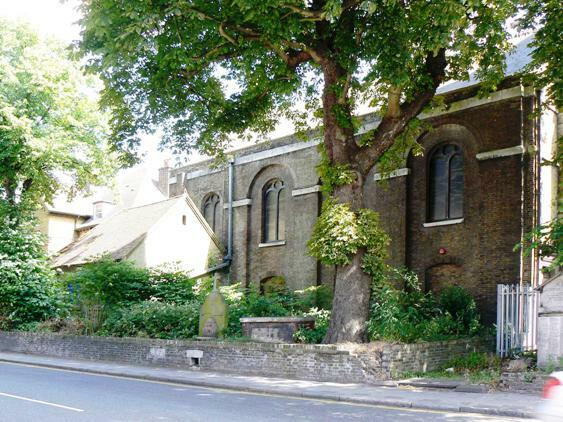 View from the north side of Brentford High Street looking across to the former parish church of St Lawrence, where New Brentford parishioners were baptised, married and buried. A chapel stood on this site by the 12th century and its tower is the oldest structure in Brentford (Q49). The body of the church was rebuilt in brick in 1764 by local man Thomas Hardwick. The church was closed in 1961. See 'Brentford Past' by Gillian Clegg for more about the history of the church and details of its monuments. Gillian's book also includes photographs and a fine 1880 line drawing of the church. Partly visible to the far right is the 1914-1919 memorial prior to its resiting in 2009, see WW1 Records for details. Further left, what appears to be a large gravestone with a cross on top, was a fresh water supply. This is marked on the 1865 OS Map as 'Drinking Fountain'. The churchyard walls originally had iron railings, presumably removed during WW2.